Satellite Internet can be a miracle cure for people who cannot order internet connection from local cable tv or phone company. People who live in rural areas in most cases cant seem to gain a quality internet connection ,No matter what they try! Are you having any of these issues with your homes internet? Do you live in a Rural area without landline connection? Struggling to log into basic internet connection? Unable to watch a short video without huge LAG? Do you wish that 3,4 and maybe even 5 people at once online? Difficulty watching Netflix on your current internet provider? Kids unable to play a game online? If any two of these problems seem to fit well into your list of internet problems then you may want to consider learning more about Satellite Internet and providers in your area. However, technological evolution over the past several years has changed. Today’s broadband internet access via satellite service is comparable and sometimes even faster! than what DSL or Cable offers. In fact, because DSL service requires proximity to the phone company’s Central Office (CO), that technology is not even an option to many rural and isolated communities across America. This may sound like a myth, for example someone who lives in WestBrookfield MA, who currently has phone service hardwired to their home from Verizon. Has not yet and probably will not ever have the option to get FIOS Internet or TV from Verizon. This would require a huge investment from the large corporation in order to construct a new signal station within the distance requirements of this very rural area and town. So how exactly does broadband satellite internet work? 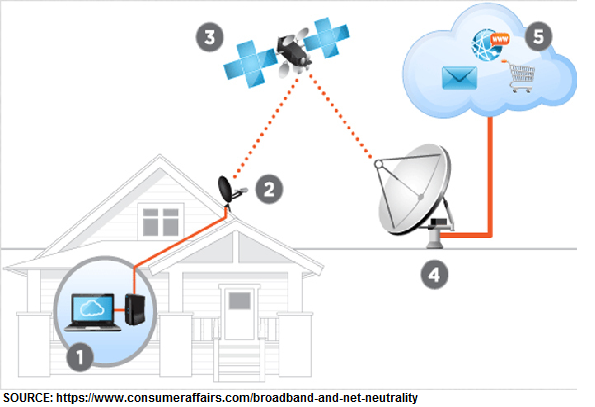 When you send a request from your computer, your modem (1) will send that request to the satellite dish (2) on your rooftop, which is then routed to the satellite (3) orbiting up in space. It is important to understand that while satellite internet service uses an orbiting satellite, it (the satellite) constantly maintains a relatively fixed location; which makes it predictable for communication requests to be sent and received to/from The craft. The orbiting satellite passes a signal, containing your request, to your service provider’s communication hub (4). The requisite data (5) – website, email, product details etc. is retrieved, and it makes its way back to your computer via the same route it took when you made the request. You may think that, with satellite signals travelling all the way into the atmosphere, and then bouncing off dish antennas and hubs, internet access might take an eternity. You’re wrong. It takes miliseconds for messages to go back and forth between various components and it’s hardly noticeable! Satellite service does not depend on physical wires and cables; it is a signals-based communication technology. If you are part of a remote community where telephone poles or cable lines haven’t yet been laid, then satellite communication is your best bet! Satellite internet service speeds are staggeringly higher than Dial-up, by some accounts even ten or more times faster! Since the cable isn’t exclusively used by you, other users that have heavy and continuous usage, could degrade quality and speed of your internet service satellite internet does not have these challenges! With a DSL connection, there’s always the possibility that, someone digging the road a block from your home or office accidentally cuts your phone line no more internet for you until the issue is fixed! Satellite internet does not face those challenges! Even if DSL service is available in the next town or community, because of the distance from the phone company’s Central Office to your community, you might not be able to get a DSL service to your home! One of the most compelling reasons for going satellite, is its universal availability: Any place that has line-of-sight to the southern skies can get access to the internet via a satellite service. You don’t need a network of cell towers or telephone relay stations or underground cables. You satellite service is truly a wireless communications service. With so much to gain, it’s no wonder that Satellite is the popular choice of most rural communities across America. Looking for Alternative to Satellite Internet ? Wireless Internet is a little more picky as far as rural areas and zip codes are concerned.. Two seperate zip codes right next to each other, One may have great signal while the other may not. The good news is typically you are able to pre-qualify your zip code prior to paying for a service that may not work once you set it up. Wireless Internet utilizes cell towers to transmit signal directly into your home. Wireless internet is certainly a credible solution. However this type of internet service uses 3G and 4G signals which can suffer from a few problematic issues of their own. like speed, or lack of. The other problem with wireless internet is the price. This service normally cost more money for data usage than most options. In most cases Unlimited Wireless Internet would be the top choice even if your needs do not require unlimited services. A single visit to watch a short video on you tube can seriously deplete all of your data for the month in just a couple minutes. Satellite Internet VS Wireless Internet ! Satellite internet access is a breeze, well not quite, There are some forms to fill out, but no digging or cable-pulling or phone-line activation involved. A qualified technician will install a dish outside your office or home, and your computer will be connected via a supplied modem to the dish. There is typically a credit report needed in order to determine if the provider will consider offering YOU these services. And that’s it: You now have your satellite internet access up and running! As for Wireless Internet , You simply fill out the form and answer a few questions then your paackage will come in the mail. Plug it in and you are LIVE! Just like WIFI!